Light microscopy image of the undescribed species of Spinoloricus, stained with Rose Bengal. The scale bar is 50 micrometers. Image credit: Danovaro, et al. (PhysOrg.com) -- Oxygen may not be the staple of modern complex life that scientists once thought. Until now, the only life forms known to live exclusively in anoxic conditions were viruses, bacteria and Archaea. But in a new study, scientists have discovered three new multicellular marine species that appear to have never lived in aerobic conditions, and never metabolized oxygen. The discovery of the new species, which live buried in sediment under the Mediterranean seafloor, is significant in that it marks the first observation of multicellular organisms, or metazoans, that spend their entire lifecycle under permanently anoxic conditions. 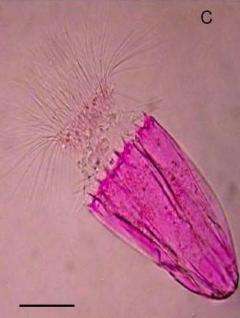 A few metazoans have been known to tolerate anoxic conditions, but only for limited periods of time. The team of Italian and Danish researchers, Roberto Danovaro, et al., that discovered the new life forms has identified the creatures as belonging to the animal phylum Loricifera, the most recently described animal phylum. Loriciferans, which have a length of less than one millimeter, typically live in sediment. The three new organisms belong to different genera (Spinoloricus, Rugiloricus, and Pliciloricus), although their species have not yet been named. Despite belonging to previously known taxonomic groups, the new species possess some radical differences compared with other metazoans. Most significantly, the new species do not have mitochondria, the cellular organelles that use oxygen and sugar to generate the cell’s energy. Instead, the new loriciferans have organelles that resemble hydrogenosomes, which are used by some single-celled eukaryotes to generate energy without oxygen. However, this is the first time that these organelles have been observed in multicellular organisms. Previous research has indicated that hydrogenosomes may have evolved from mitochondria, while other research suggests they evolved independently. To find the new species, the researchers carried out three oceanographic expeditions from 1998 to 2008 to search for life in the extreme environments located more than 3,000 meters (about two miles) under the Mediterranean Sea. The researchers focused on an area called the L’Atalante basin, which is located off the southern coast of Greece. As the scientists explain, this type of “deep hypersaline anoxic basin” was created by the flooding of mineral sediments from 5.5 million years ago. For the past 50,000 years, the basin has possessed a dense hypersaline brine layer up to 60 meters thick. The brine serves as a physical barrier that prohibits oxygen exchange between the water and sediment, making the basin completely oxygen-free. In addition, the basin is rich in methane and hydrogen sulphide, and is also home to a diverse assembly of prokaryotes that have adapted to these conditions. Because previous studies have reported the presence of cadaverous metazoans that had sunk to anoxic deep-sea sediments in the Black Sea, the researchers here stained the newly collected specimens with Rose Bengal, a protein binding stain that colors living organisms with a much greater intensity than deceased organisms, demonstrating that the new species were indeed alive. 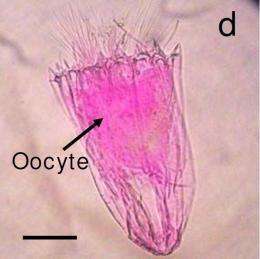 In addition, the scientists observed specimens of the undescribed species of both genera Spinoloricus and Rugiloricus that had a large oocyte in their ovary, which showed a nucleus containing a nucleolus, providing evidence of reproduction. LM image of the undescribed species of Spinoloricus stained with Rose Bengal showing the presence of an oocyte. Image credit: Roberto Danovaro. The work is financially supported by the EU within the framework of the HERMES (Hot Spot Ecosystem Research on the Margins of European Seas) and HERMIONE (Hotspot Ecosystem Research and Man's Impact On European Seas) projects. This suggests life might have evolved on other planets, which is exciting. More than that, it suggests that _multicellular_ life can develop in more varied locations than we previously thought. Now we just need to refine our testing methods for finding life off-planet. This is what I've been saying when people talk about "life as we know it." We have no idea how life could develop elsewhere, since we only have one example. This find really says that forms of life very different from our own can indeed exist. Very exciting! They should take some of these organisms and put them in Mars-like conditions and see if they are able to survive. Studies on this organism can only advance our knowledge and understanding of biology. While I share thoughts with some of you about experimentation with this lifeform (and others) on other planetary environments, I am more immediately concerned with researching its ability to produce energy without oxygen, and whether there are opportunities to exploit this as we have for the first time a multicellular organism capable of anaerobic energy production (as opposed to other single-celled extremophiles). Most interesting is that we have only just discovered Loricifera; what other exotic multicellular lifeforms lie in wait in the briny deeps? Fascinating! evolution shows it's capability in facts like this. 'Has the planet an oxygen rich atmosphere' pointless when looking for life. The timing is key to this most unusual discovery- is it the 5.5 million(current Med. flooding), the 50,000 year(anoxic layer formation), or a longer sequence of the several flooding and evaporate/draining's of the Mediterranean Sea, which led to the development of this and possibly other anoxic path multi-celled life type? The original full text may give the answer, or as indicated it may as yet be a mystery. Mars, with ice, water vapor, methane, hydrogen sulphide, and nearly no free oxygen, and, 4 billion years time? Our science is bound by a pervasive liquid water state filter, preventing a larger catalog of possibilities elsewhere. In addition to the above points, this discovery means that multi-cellular life may well have existed before the so called 'oxygen catastrophe' which is estimated to have happened some 2.3 billions years ago when free oxygen first entered the atmosphere in significant quantities. My guess is that the deeper we dig, the more examples of life adapted and evolved to exist in anaerobic environments will be found. As Parsec pointed out- the earth had already been around for quite a while before oxygen became plentiful enough to be used for metabolism. But why should that have stopped Life? I love this story. I don't intend to start a religious debate, but I often hear creationists state "what are the odds that everything would be so finely tuned that everything would end up like this"(referring to life as we know it). I think the best reply is "who said it had to be like this". We constantly see that the universe can take a seemingly infinite number of paths and we are only one. We need to broaden our minds as to what is alive and what intelligence is. I wonder if artificial intelligence will ever become sentient as we define it? When will we find a recovery of solid sediment with remains that can be dated? From a difficulty of dredging the lower sediment layering, perhaps a C14 or similar dating of small samples can give an accurate timing of older non-living examples? Med. rock samples such as Melanophlogite, with embedded methane in silica deposits give a story of historical methane in the 'periodic' Med. Sea. Can fossils of these be distinguished from other oxygen demand types? How deep would caverns be from the drying Med, area between multiple flooding and deep sea water presence? These are two miles depth, and then cavernous passages possibly for stable long term survival for many millions of years?